Options for the mobilisation of funding to ensure effective antibiotics and combat antimicrobial resistance. Effective antibiotics are critically important cornerstones of all health systems, but bacteria becoming resistant threaten antibiotics continued lifesaving value. A return to a pre-antibiotic era would have devastating impacts on global public health as well as the global economy. 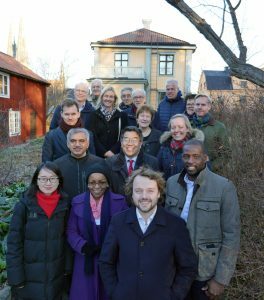 In December, the Dag Hammarskjöld Foundation and ReAct (Action on Antibiotic Resistance) organised a joint workshop in Uppsala, Sweden, inviting 20 international experts in the field of antimicrobial resistance (AMR) and global health. The participants were invited to search together for financing options for this growing issue. Together they examined options for the mobilisation of capital and proposed new and existing funding streams to invest in addressing AMR. The outcomes of the workshop will feed into the ongoing discussions on future global governance for AMR. Antibiotic resistance alone, including drug-resistant tuberculosis already claims more than 750,000 lives every year. Low- and middle-income countries will likely bear the brunt of the negative consequences. These countries experience the combination of the greatest burden of infectious diseases and the weakest health care and agricultural systems. The UN Interagency Coordination Group on Antimicrobial Resistance (IACG) highlights in a discussion paper from June this year that there is rarely enough financing from either government ministries or development partners to put National Action Plans (NAP) on AMR into action. Development start-up funds and projects are difficult to access because AMR is not seen as a development priority. In all cases, lack of adequate evidence about the cost of doing nothing means that donors and investors do not prioritise AMR. We currently do not have a ‘go-to-place’ for funding the implementation of National Action Plans on AMR and this is a serious global concern. It is widely acknowledged that the consequences of AMR will negatively affect and potentially jeopardise the achievement of many of the Sustainable Development Goals (SDGs). The frightening dynamics of spread of multi-resistant infections such as neonatal sepsis, multidrug resistant gonorrhoea, extensively drug-resistant typhoid fever and tuberculosis is continuously adding to the health and economic burden of developing countries. These are then compounded by lack of clean water, hygiene facilities and infection prevention and control. AMR is a consequence of systems failures and should therefore be seen and addressed through a systems perspective. This means that health and agricultural systems should be transformed through both AMR-specific and sensitive actions with the overall goal of ensuring equitable and sustainable access to effective antibiotics for all in need including by reducing misuse. The lack of a funding home – a ‘go to place’ for countries to seek support is a great risk. Broad investments are needed to minimise AMR’s negative impact on the achievement of several of the SDGs. To successfully implement NAPs on AMR, they must be funded. Doing so will prevent the risk of weakening the global political momentum that has been achieved over the last few years. The input from the participants at the workshop will be used for future publications by the Foundation and ReAct. We hope that the meeting stimulated further deliberations and accelerated the availability and access to sustainable funding for AMR. This meeting resulted in the publication of a paper, you can read it here.